David Friedman has written songs for everyone from Disney to Diana Ross. Personally, I have learned a lot about David's music through my love of Kathie Lee Gifford who has recorded many of his songs and collaborated with him for years on The Today Show's segment "Everyone Has a Story." But, as it turns out, I have actually known of David Friedman's music ever since I was a kid through the films Beauty and the Beast and Trick. Now, it's such an honor to have the chance to interview David about working with Kathie Lee, the legendary Nancy LaMott and his new musical (co-written with Peter Kellogg), Desperate Measures, which after a 3-time extension in 2017 at The York Theatre is now coming to New World Stages (340 West 50th Street, between 8th & 9th Avenue) for an open run, starting May 30! Click here for tickets! Starring Lauren Molina, Conor Ryan, Gary Marachek, Peter Saide, Nick Wyman, & Sarah Parnicky, Desperate Measures is a hilarious new musical that tells the tale of "Johnny Blood," a handsome young man whose life is in danger over a saloon brawl. For more on David visit http://www.middermusic.com and follow him on Twitter! 1. Who or what inspired you to become a composer? Hm, that’s a very complicated question. From a very early age I showed a lot of musical talent, studying guitar when I was 5, piano a few years later, and eventually going to New England Conservatory of Music. My thought, and my parents’ desire, was that I would be a classical musician. From the age of 5, I also studied at the Dalcroze School where I was taught Eurhythmics, a method of learning music through the natural use of the body. When I was 17 I received a teacher’s certificate from the Dalcroze School, and when the head of the school presented it to me, she sat me down and said, “You are the youngest person ever to receive this certificate, you are one of the most gifted musicians to ever walk through these doors, and you potentially have a great career ahead of you in music. However….recently I have noticed a ‘trashy nightclub idiom’ infiltrating your improvisations, and if you are not extremely careful, you might end up in the pit of a Broadway Show.” I noticed, out of the corner of my mind, that that thought delighted me. Throughout my stay at New England Conservatory, I studied classical piano and choral conducting, but I kept my Dionne Warwick and show tune albums hidden behind the Shostakovich symphonies. When I finished college, I went back to New York City, my home town, and immediately began music directing Off Off Broadway theatre. This soon led to me conducting on Broadway and then, after I met Alan Menken, to conducting and vocal arranging Disney movies such as Beauty and the Beast, Aladdin, Pocahontas and The Hunchback of Notre Dame. I was now a prominent Broadway and film conductor, but I knew, in my heart of hearts, I was hiding behind other people’s music because I was afraid of going public with my own. I first started writing songs, sort of in secret, in college. Or I should, more accurately say, songs first started writing me. I’ve always had the understanding that I don’t write my songs, I open to them and receive them from some unconscious, infinite place that is much more knowing than my conscious self is. When people hear my songs and suggest that I must be very centered and wise to be able to write such things, I often say, “If you think I think that 'Help is on the Way,' you’re seriously mistaken. My writing started when I was having serious emotional issues, which came from the fact that in many ways, I didn’t know who I was and was living an inauthentic life. I was studying to be a concert pianist when theatre and songwriting were my true passions. I got married to a woman at the age of 20 when deep down I knew (only unconsciously) that I was gay. The songs came through as guides to the truth that lived deep within me. Early songs like "A Song of Hope," "Accept Yourself," "My Feelings are too Big For Me" (songs which almost nobody has heard) pointed the way for me to self actualize and start to move toward my real dreams and desires. Although I’d been composing in secret since my teens, throwing my hat in the ring as a composer seemed like the most frightening thing to me. There was something so emotionally revealing about it that I resisted putting my music to the forefront. It was actually cabaret that really started me writing the songs that are well-known today. When I conducted Joseph and the Amazing Technicolor Dreamcoat on Broadway, Laurie Beechman, who was starring as the "Narrator," asked if I would play her cabaret act for her. This led to her asking me to produce her first CD. (At that time not a lot of people were making their own CD’s). As part of that process, I was inspired to write "Listen To My Heart" for Laurie. (Many people think I wrote that song for Nancy LaMott, and even though it did become her signature song, I originally wrote it as the title song of Laurie’s first CD). When that song became successful and well-known, I became bolder, and when I met Nancy LaMott, I was so inspired by her that I wrote "Help is on the Way," "We Can Be Kind," and "Just In Time For Christmas" (with David Zippel) for her. I credit Alan Menken with giving me the push to be a theatre and film writer full time. I was in Houston, music supervising the out of town tryout of Beauty and The Beast Broadway. I was also, at the time, conducting and vocal arranging the film Pocahontas. One day, Alan and I were talking, and I said to him, “I’m making a fortune here, but I’m depressed.” And Alan said, “I’m going to shoot myself in the foot here, but you’re depressed because you’re one of the few people who’s supposed to be doing what I’m doing. If I were you, I would take three years and phase me out of your career.” This was an extremely generous thing for Alan to say, because we had a fantastic working relationship and he was willing to give that up to allow me to reach my full potential. So I turned down future offers to conduct and began to write my own musicals and films and continued to write songs for artists. And that’s what I’m still doing to this day. What I especially love is Peter’s brilliance in keeping these important and “heavy” issues constantly light-hearted and funny. The experience of the audience is constant laughter and enjoyment, and yet the message surreptitiously sinks in. One of the most gratifying things about the York production was that a lot of people came back to see the show 5, 10, even 15 times, not only because they wanted to laugh, but because they found new things in it each time. I’m excited that even those people who've seen the show that many times will find new and fun details in the New World Stages production. Two other things excite me about the experience of moving the show to New World Stages. First and foremost, it’s probably the happiest, most gifted company of people I’ve ever worked with. The cast, (Gary Marachek, Lauren Molina, Sarah Parnicky, Conor Ryan, Peter Saide and Nick Wyman, our director, Bill Castellino, our brilliant music director/orchestrator, David Hancock Turner, and our extraordinarily dedicated and passionate producers, Pat Addiss and Mary Cossette make it a dream to come to work every day. We only had 10 days to rehearse the show at the York, so even though five out of the six cast members are the same (Sarah Parnicky is replacing Emma Degerstedt as "Sister Mary-Jo"), our director and all the actors are really committed to digging deeper and mining all sorts of new understanding this go-round. The result is that although it’s the same show, it’s even funnier, even more real, and even more detailed than it was at the York. It’s exciting to see these brilliant people take such good care of our material and mine it for things that sometimes Peter and I didn’t even know were there. Oh, and I also have to say that I’m so enjoying being recognized with so many award nominations this season. It’s lovely to be nominated, it’s been even lovelier to win some of them, but the best part is really feeling a part of this amazing community and getting to hang out with so many gifted and wonderful people at all the events. 3. Let's go back to the beginning for a moment. How did you and Peter first come to work together? Peter and I met on another project, a musical called Aucassin & Nicolette. Peter had worked on it with another composer and they’d come to a parting of the ways. Peter brought it to Gordon Greenberg who was, at the time, running Musical Theaterworks, and asked him if he had any suggestions for a new composer for the piece. I had worked with Gordon when he was a child actor in the infamous Broadway flop, The Little Prince & The Aviator (I’ve actually had the distinction of having three posters of musicals I’ve conducted on Joe Allen’s wall of flops - Sarava, The Little Prince and the Aviator and Scandalous) and Gordon suggested Peter contact me. He did, I read the piece, thought it was brilliant, and we’ve been writing together ever since. 4. This is the fifth musical you & Peter have written together. What is the best part about your collaboration? I like to think of our collaboration as a long and successful marriage. Like a marriage, it has its ups and downs, we have our differences, but the deeper principles that underpin the relationship have remained in tact. Peter and I have different skills. He’s incredibly well-read, smart (Harvard English Major) and has a dry and deft sense of humor and a desire to make people laugh. I’m certainly funny too, but my main interest is in making sure our writing connects emotionally with the audience. These checks and balances work very much in our favor as collaborators. I like to say that if Peter had complete control of the piece it would be very funny but might be a little dry and distant. And if I had complete control, you might want to throw up from all the emotion. Working together, we try to create the best of both of those worlds, pieces that really entertain you but go to your heart. Peter and I also have a “no-one-wins-or-loses” rule. We have to agree, no one pulls rank (“There’s never, “Well, I’m the composer so you have to accept my music the way it is.”) We battle it out for as long as it takes, sometimes months, even years, until we come to something we both love. Lauren Molina in "Desperate Measures"
5. How did you approach writing the music for this show? Although I have spent some time in Nashville and have written country songs, country music is certainly a bit of a departure for me. But I love the genre, and I love how emotional and fun it can be, so I was up for the challenge. There’s a maxim that I heard many years ago, I think Mitch Leigh, who wrote Man of La Mancha, was the first to say it to me. It says, “When you have to write a historical or genre piece, write it first, do the research later.” What this says to me is, people in particular locations, life-styles or periods of history, talk and sound the way they do because of their specific circumstances. If I were in those circumstances, I would talk and sound like them too. So I put myself in the circumstance of the play and I draw the sounds from inside of myself, of course with some technical and aural knowledge of, in this case, country music. It’s not the first “period” or “genre” piece Peter and I have written. Aucassin & Nicolette takes place in 13th century France and Carthage. Nellie Bly takes place at the turn of the century. In each case, I write the “style” songs in the idiom of the period, but I write the emotional songs in typical “David Friedman” style, because I feel that inside, in the world of emotion, we’re all basically the same, no matter what we look or act like on the exterior. So I try to reach the universal heart by writing the pieces that need to be emotional in my naturally emotional style. I can’t tell you how many people have come up to me after the show and said, “I’m not a country music fan and I thought I wouldn’t like this, but I loved the music. To which I usually reply, “That’s because this is Jewish country music.” It’s country music the way it comes through me. 6. What was the hardest song to write and which song just flowed out of you? Peter is generally the one who comes up with the ideas for our shows, and he usually presents me with a full script and lyrics. Then we spend about four months just talking about it…I don’t write a thing. I ask a lot of questions about why this or this is happening, what I’m unclear about, what I think is missing, we make a lot of tweaks and changes, and at a certain point it just seems ready to start writing itself. The songs usually pour out quickly. Songs like "It’s Good To Be Alive," "That’s Just How It Is," "Just For You" poured out quickly, sometimes in under an hour. The songs that took longer were the complex ones that had to capture specific humor and plot points and interweave characters with complex vocal arrangements. (I also do the vocal arrangements myself. I’ve always loved doing that, for Broadway shows and on all the Disney movies I conducted.) So "In The Dark" at the end of Act 1 took a long time. We also often tweak, change and even replace songs as the musical unfolds. It’s one of the things I love about working on musicals. You’re putting so many pieces together, you have to know the end to write the beginning correctly, all characters and emotional points have to be accounted for. So we rewrite a lot. 7. The press release states that you will leave this musical smiling. What is the last show you saw (aside from this one) that left you smiling? I’m a very non-critical audience. By that I don’t mean that I don’t see what works and what doesn’t work about shows, but I go to the theatre to be entertained, to enjoy myself and to take what’s good from each show. So I think I leave smiling for different reasons. I left Sponge Bob smiling because it was just so much fun. I left The Play That Goes Wrong (not a musical, I know) smiling because it was just so hilarious. And I left Carousel smiling because every time I see that show I weep uncontrollably for the final 20 minutes (this time my partner, Shawn Moninger, essentially brought a roll of paper towels which he handed me at the appropriate time, knowing I’d need it.) I just saw Bernadette Peters do Hello Dolly!, and I left smiling not only because the show was so frothy and funny (with a spectacular supporting cast as well) but because there were places where Bernadette went past the froth and fun and brought an amazing and recognizable emotional truth to her conversations with "Horace." 8. I'd like to shift gears and ask you about some of the artists you have worked with. Personally, I came to know a lot of your music through listening to Kathie Lee Gifford. I also love the "Everyone Has A Story" segment you created with Kathie Lee for The Today Show. Since "Everyone Has A Story," what is one story about yourself that you haven't shared in a previous interview (either professional or personal)? Kathie and I have written almost 100 songs for the "Everyone Has a Story" segment. There are many joys connected with doing that segment. The greatest joy is perhaps that we’re telling important stories that make a difference in the lives of both the story-tellers and the people who hear them. It’s really gratifying to meet all these brave, exciting, interesting people and see their reaction to having their story told in this public way. A lot of important causes have been promoted, quite a number of people have used their presence on the show as a stepping stone to do a lot of good in the world, and at the very least, we get to give hope and love to people who are often going through something challenging. The other joy is that Kathie and I get to continue to write songs together, and I find that it keeps my craft in tip top shape, having to write a different kind of song on a different subject every month. And it doesn’t hurt to know that every one of those songs will be heard on national television. So often we write songs and have no idea what the outlet for those songs will be. It’s wonderful to know that every one of these songs gets to be shared so quickly and so broadly with a wide audience. And last but definitely not least, every month we pick a different Broadway star to come on the show and sing the song with me at the piano. It’s a thrill to meet and work with some of the greatest talents around. Some are my friends, some are my idols, and some I’m discovering and meeting for the first time. The segment also lets us promote the shows these people are in, and I’m always up for giving Broadway a boost. A story I’ve never told anyone. Hm. As you can see, I’m so long-winded, and not at all a secretive guy, it’s hard to think of something I haven’t shared. Let me see. Ah, here’s a lovely story that I don’t believe I’ve ever shared in an interview. As I mentioned, I’ve been doing everything I could over the years to keep Nancy LaMott’s music alive, funding all her posthumous CD’s out of my own pocket. I’d decided to put out a CD of Nancy singing David Zippel’s lyrics, since David was such an integral part of her life and also had co-funded Nancy’s first CD with me. To defray the cost, and to give Nancy’s fans the opportunity to actively participate, I did a crowd funding campaign. The campaign was going very well with a lot of people enthusiastically responding and giving. But we were still a bit short of our goal as the deadline drew near. One day I opened my campaign website, and there was a $3,000 contribution from someone I'd never heard of. Since she hadn’t asked for any perks, I emailed her to thank her for her generosity and ask if she would like some custom perk in exchange for her donation. She emailed me back, saying “Call me.” I called her and she told me that she’d actually wanted to give more but Paypal had asked for her social security number for a larger donation and she didn’t want to do that. She then told me that when she had been going through a difficult time in her life, my songs had saved her life. How gratifying for me to know that someone I’d never met was being helped by my songs. That’s why I write them, and had she not even given any more money that would have been enough. But she chose to give us a $10,000 matching grant over and above the $3,000 she’d already given. And the moment we announced that, the rest of the money for the CD came flooding in. As I’ve said elsewhere, I don’t write my songs, they come to me as pieces of information and advice that I need to hear. The line from my song "Help is on the Way," “From friends you may not have met…yet” was certainly true here, and I was very grateful. 9. I also must ask you about working with the amazing Nancy LaMott. What do you miss most about her? Oh, boy! I miss EVERYTHING about Nancy. She was a wonderful human being, a good friend and truly my muse. i just loved writing for her. She had such an unerring interpretive sense that I could trust her to give my songs a brilliant reading, better than I even imagined them, even if we didn’t get to rehearse together before a performance. Case in point, Nancy and I used to close John Znidarsic’s wonderful In Celebration of Life event every year with a new song. The year I wrote "We Live on Borrowed Time," Nancy was out of town and we didn’t get to do the song together until we actually met on stage during the concert. The recording that we put out is actually of that concert. It was the very first time she sang the song, with no coaching from me, and it was perfect. I also of course miss the studio, with the magic she created with Christopher Marlowe at the piano, and later with Peter Matz orchestrating. And the ever-expanding performance venues that she played as she climbed quickly up the ladder. In a year’s time she went from the smaller venues like Don’t Tell Mama and Eighty Eights to Tavern on The Green, The Algonquin and concert halls around the country. We were planning Carnegie Hall for the following year, but she left us before that could happen. I often wonder about where Nancy would be today had she lived; the great things we might have done together, the songs I might have written for her, the places she’d be playing. I have to say, she’s gone 23 years now and I’m still not over her, and I’m sure I never will be. One gratifying thing is that last year my book publisher (I write metaphysics books - a whole other subject) came to me and asked me for a new book idea. So I took my song, "We Can Be Kind," and created a book using one line of the song for each chapter heading. The book is called - We Can Be Kind - Healing Our World One Kindness at a Time, and its filled with essays and stories about Kindness, as well as ways in which we can be kind to others and perhaps most importantly, to ourselves. As part of this project, we created a beautiful video with Nancy singing the song that can be viewed at bit.ly/wecanbekind. I’m so thrilled that so long after her passing, Nancy’s voice can be used to promote a cause that truly embodied who she was. 10. Who haven't you worked with that you would like to? Ooh, lots of people. Dionne Warwick was my idol growing up. I got to meet her on The Today Show and she told me how to send her songs. I sent her some, and got a lovely note from her saying she loved the songs and hoped to sing them someday. I REALLY hope that happens. 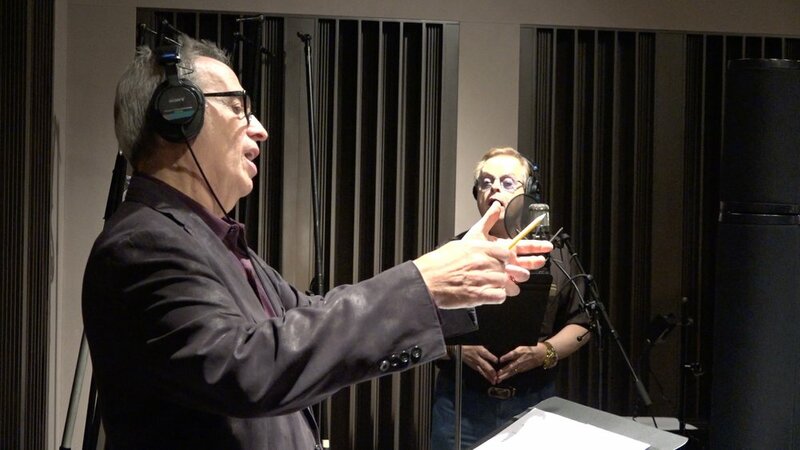 I’ve always dreamed of Barbra Streisand recording a song of mine (well hasn’t everyone!). Mostly, there are so many great Broadway actors and directors who I would love to have work on Peter’s and my musicals. 11. What haven't you accomplished that you would like to? Oh my God! The list is long. I would love to see the two other Broadway Shows Peter and I have written open and be successful on Broadway. Aucassin & Nicolette is what we’re going to do next because, like Desperate Measures, its time has come. It’s about The Middle East, it’s about Christians vs. Muslims, it’s about racial prejudice, about money vs. love. And like Desperate Measures, it’s in verse and it’s hilarious. The three productions we’ve had around the country have all done very well and we’re hoping to bring it in to Broadway next year. Also, our musical Nellie Bly is the story of one of the most famous women in the world, a pioneer in not only women’s rights, but equal pay, exposing injustice and going for your dreams. It’s a big Broadway musical and I’d love to see it happen. It’s a virtuoso starring role for a young woman on the order of, say, Funny Girl. I’d like to see Nancy LaMott’s work spread to a much wider audience. I’d like to travel the world, preferably with companies of a hit musical of mine. I’ve never been to Tokyo or China or Australia. I’d like to finally have a New York production of the Christmas piece I wrote with Deborah Brevoort, King Island Christmas, It’s had over 50 productions around the world, it’s a stageable concert piece about community and inclusiveness for choir and soloists, but it has not yet played New York. We have a great recording of it and license it all the time, but it’s a dream of mine to have one of the great New York choirs do it with a cast of my favorite Broadway stars. I’d love to have my piece We’ve Got To Get Back To The Dream, written for Symphony Orchestra, Choir and R&B diva used in some big way to support political candidates who understand what this country is really about and help us get back to the values under which this country was begun centuries ago. I wrote it in 1992 and it was performed by the Pacific Symphony. It’s another example of something I wrote a long time a go that has now become more timely than ever. And I’d really love to have someone sing my song "We Can Be Kind" in a way that reaches the entire world. Barbra Streisand or Celine Dion or Diana Ross or Dionne Warwick. Lady Gaga would be the perfect combination of chops and heart in the right place. Of all the songs I’ve ever written, this is the one song I would like the entire world to hear. At this time, more than ever, I feel that my biggest contributions can be the messages of kindness and laughter and understanding. I’m very blessed to have so many opportunities to share this message in my work, and it’s my deepest desire to share it in bigger and more far-reaching ways. David Friedman has written songs for everyone from Disney to Diana Ross; has written four other musicals with Peter Kellogg: Money Talks (Off Broadway run at the Davenport Theatre), Aucassin and Nicolette (Barrymore Award for best score), Nellie Bly and Lincoln in Love; collaborated with Deborah Brevoort on King Island Christmas; has performed his revue Listen to My Heart: The Songs of David Friedman for audiences Off-Broadway, all over America, and abroad; wrote songs for The Lizzie McGuire Movie, Aladdin and the King of Thieves, Bambi II, and Trick; scored three television series; contributed music to Broadway's Scandalous; conducted and vocal arranged six musicals on Broadway and numerous Disney animated films, including Beauty and the Beast, Aladdin, Pocahontas, and The Hunchback of Notre Dame; produced all of the late/great Nancy Lamott's CDs and wrote many of her best-known songs; and is currently in his eighth year of co-writing a song a month with Kathie Lee Gifford for the "Everyone Has a Story" segment on NBC's The Today Show.